**This is a Read Pink edition. In October 2010, Penguin Group (USA) launched a new initiative in support of Breast Cancer Awareness Month. This October, we are pleased to continue the program with a donation of $25,000 to the Breast Cancer Research Foundation(r) and are presenting eight beloved titles in special Read Pink(tm) editions: The Perfect Poison, by Amanda Quick The Border Lord's Bride, by Bertrice Small With Every Breath, by Lynn KurlandDanger in a Red Dress, by Christina DoddEarly Dawn, by Catherine AndersonThe Secret History of the Pink Carnation, by Lauren WilligA Duke's Temptation, by Jillian HunterTribute, by Nora Roberts Victorian London holds many secrets. But none are so closely guarded as those of the shadowy Arcane Society. 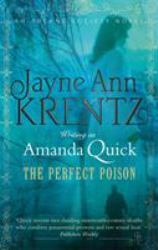 In her suspenseful new novel, "New York Times"-bestselling author Amanda Quick delves into this underworld of passion, greed, and powers that lie beyond this realm . Plagued by rumors that she poisoned her fiance, Lucinda Bromley manages to live on the fringes of polite society, tending her beloved plants-and occasionally consulting on a murder investigation. For the notorious botanist possesses a unique talent: She can detect almost any type of poison, especially ones that have their origins in the botanical kingdom.But the death of a lord has shaken Lucinda to her core. At the murder scene, she picks up traces of a poison containing a very rare species of fern. So rare, in fact, that only one specimen exists in all of England- and it was stolen from her conservatory just last month.To keep her name out of the inquest and to find the murderer, Lucinda hires fellow Arcane Society member Caleb Jones who runs a psychical investigation agency. A descendant of the founder of the Society, Jones is very skillful at protecting its secrets-and frighteningly good getting at the truth. Immediately, Lucinda senses both a raw power and an undeniable intensity in the imposing man.But as a nearly overwhelming desire blooms between Caleb and Lucinda, they are drawn into the dark heart of a deadly conspiracy that can be traced to the early days of the Arcane Society -and to a legacy of madness that could plunge Caleb into the depths of his own tortured soul.